The B&B was great and the OLD city jail is very interesting.Fishing was also great. The Wilson City Cemetery, just east of town, gets decorated with flowers and flags every Memorial Day. An Avenue of Flags is located at the north end of the cemetery, and St. Wenceslaus Catholic Cemetery is located on the south end. 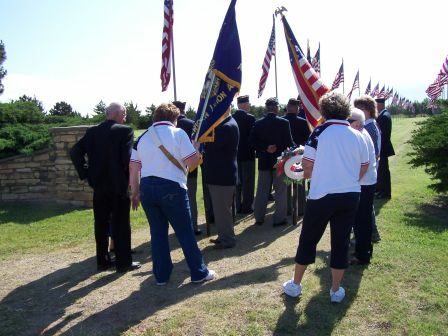 In this picture the color guard and firing squad and other American Legion Post 262 members form a parade to place a wreath at the Veterans Monument. Gold medal shot put winner from the 1929 Olympics, Bill Kuck, rests within the iron fence, along with many notable former residents of the area.